Good For Pictures..., originally uploaded by jaminsky. The vegetal taste in coffee seems to come from two main sources. Neither of which should be considered desirable. 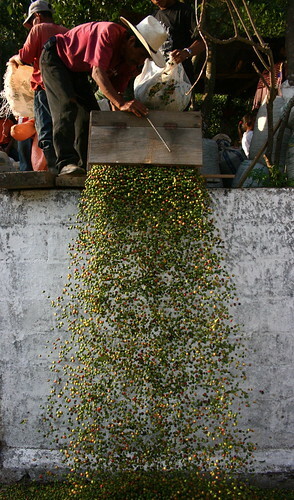 One is the under ripe coffee cherry that adds a vegetal or herbacious note. You know your stuff when you can pick out the under ripes in a batch of unroasted coffee. The hemp descriptions of Sumatras and coffees like Chiapas come to me as more of a high under ripe percentage than true origin character. Under ripe are dulling so in a good roast, the sweetness is severely diminished by these buggers. The other source is often a very common roast error known as roasting raw. This grassy astringency doesn't always become evident until the coffee is allowed to rest a few days and settle. Roasting raw is defined in the cup by a grassy smell identical to that of steamed green coffee and a punchy acidity that can turn weaker stomaches. It is often the hollow flavors and strong acidity that make this easy to identify as what we jokingly call 'green'. Roasting raw is excessively common and can hide other problems in the cup while giving the fleeting impression of sweetness. The joke is that roasting raw can hide the age in a coffee and cover over a lack of character in some less stellar coffees where fixing the profile would make the coffees look decidedly poor. The cup will be initially sweet but eventually become hollow, have quickly fading flavors post roast, prove difficult in consistent brewing as a bag ages, and just unpleasant difficult to control acidity.